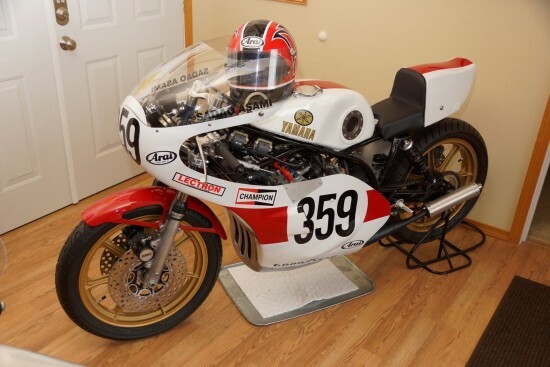 The second of three very rare Yamaha TZ750 race bikes available this past week, this 1973 model is claimed to be a rare prototype machine. Fans of both ClassicSportBikesforSale.com and RareSportBikesforSale.com have proclaimed all three of these machines to be overpriced, but you can’t argue that they are very cool and very valuable motorcycles regardless of their asking prices. Yamaha’s TZ750 was all brawn and no brains, a power-mad beast of a bike that packed 140hp into a sub-400lb package good for 185mph, with basically terrifying handling when it was introduced. 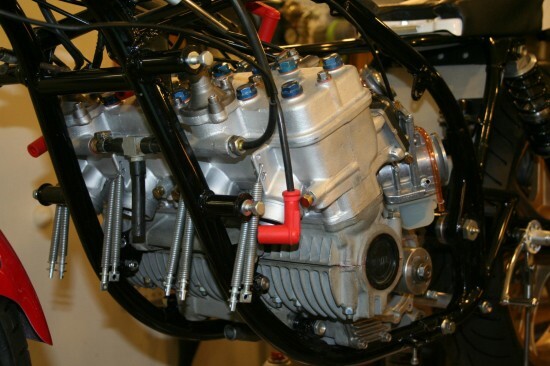 But that power came with reliability, and the TZ dominated AMA racing for years in spite of its lethally bad manners. This example is supposedly a “prototype” numbered #001, although I’d definitely want to consult with a TZ750 expert before plunking down my hard-earned cash. 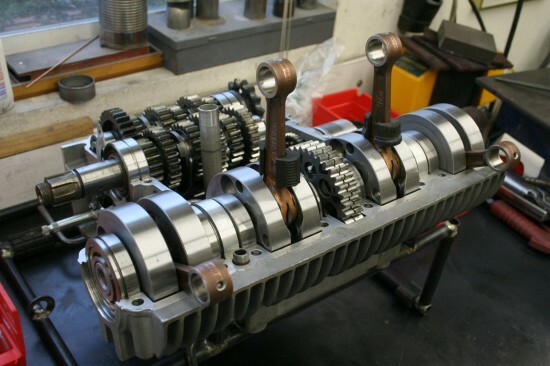 It’s certainly in impressive cosmetic condition and will undoubtedly look amazing on display. Early TZ’s used a twin-shock rear suspension as seen here, although later bikes moved on to a more modern monoshock set up that vastly improved handling from “scary” to “less scary” as the bike struggled to cope with increased power from the significantly revised powerplant that went from 700cc’s in early bikes to the full 750cc’s in the name. This is the rare only one built by the Yamaha Race department. 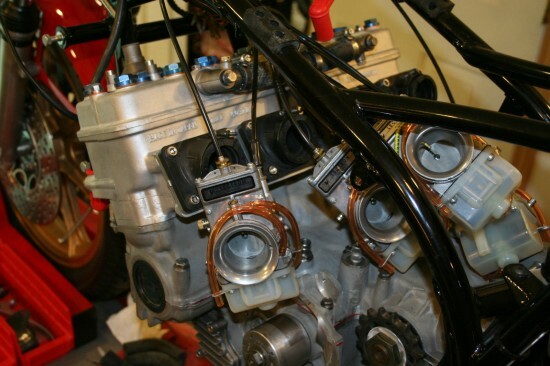 It was finished in 1973 for Kel Caruthers to inspect and make final changes for the completion of the production TZ700/750 for release in 1974 for Daytona and European distribution. What you see are some of the salvaged parts that were intercepted on the way to the crusher and torch. The main part being the frame and swing-arm stamped 409-100001. 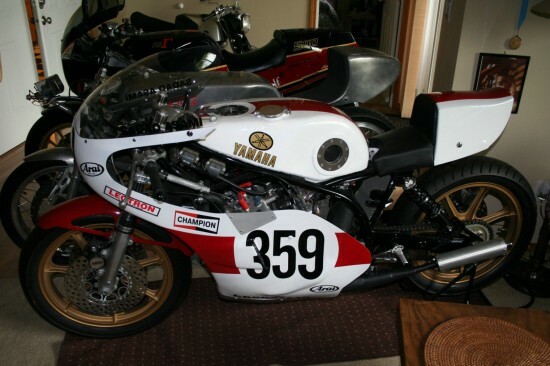 This bike remained in the hands of factory rider Sadeo Asami until it was returned to Yamaha USA in the late 70`s. I sat in storage until 2012 when I was able to purchase the parts. A good friend and I spent 3 years bringing it back to as last race condition and another year to where it is now. This is the bike that changed racing history. I would be curious, and I’m sure the seller can tell you, whether or not it runs. From the description, it sounds as if it does. This would obviously make a beautiful display piece and centerpiece to a collection, but racing machines I feel should always be kept in running condition, even if it’s only for parade laps and demonstrations. The Buy It Now price is set at $78,000 which, as stated previously, is very high for a TZ750. They’re pretty rare, but 600 were made and, even accounting for the attrition that naturally occurs during racing, it’s possible to find these regularly circling tracks in vintage racing events. Regardless, I’m happy to see the bike offered up for sale, so we can all drool over it and think about how many extra kidneys we’d need to grow in order to be able to afford it…. Tad, this TZ is very cool. However, there is a very rare ’83 Kawasaki that is the racing version of the Eddie Lawson Replica. Only 28 were built by Kawasaki, they were built to compete in AMA Superbike racing. There is a lot of Rob Muzzy in these bikes. You had to have connections to buy one of these. It can be found on ebay under “Kawasaki:Other” pick the years from 1981 to 1983. Thanks for the heads up on that Kawi! I did see it, but felt like I couldn’t really accurately speak to the bike’s authenticity.